Watch car culture work: An advertising regulatory body in the UK has banned several ads by carmakers — including Ford, Nissan, and Fiat Chrysler — because they encourage dangerous driving. ‘Bout time! If only we could challenge car culture this aggressively in the US. Trans athlete support: A petition has emerged to document support for transgender cycling athletes following the post-World Championship backlash experienced by track racer Rachel McKinnon. Right turn ban: As part of their Vision Zero efforts, D.C. transportation officials are considering making it illegal to turn right during a red light. This week’s Monday Roundup is brought to you by Western Bikeworks. 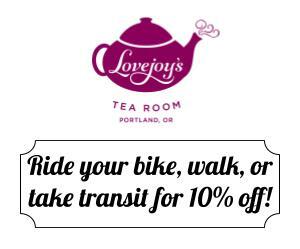 Visit them in Tigard, Portland (NW Lovejoy & 17th), or online. No excuses: The NYPD is reportedly too busy to deal with a horrific collision where a man and his son were struck by an errant driver as they walked across a street in a crosswalk. Silly walks FTW: Portland has tried a ‘Barnes Dance’ crossing, we’ve done fun crosswalk paint, now we should follow the lead of our friends in Rotterdam and install a “silly walk”. Aging and racing: As someone who is thinking a lot about age lately, I enjoyed this reflection on the role cycling plays in the life of 69-year-old Cyclocross Magazine writer Lee Waldman. Charged carbon: New research shows that carbon fiber can store energy. Imagine what that could do to make e-bikes lighter! 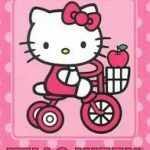 Scooter users = friends: Bicycling Magazine writer (and online activist) Peter Flax says it’s time to bury the hatchet and embrace our two-wheeled brethren who ride e-scooters. 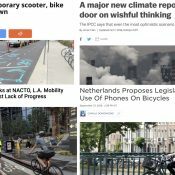 Blumenauer on the future: Streetsblog grabbed Portland’s U.S. Congressman Earl Blumenauer for an interview during the Railvolution conference and asked him about transit funding and the future of transportation policy in America. More bad news about Uber and Lyft: A new study suggests that cities with high rates of Uber and Lyft use have experienced more traffic deaths. Free beer for cycling: A city in Italy has a program where you can gain points for not driving and redeem them for treats like ice cream, movie tickets, and even beer! I like the free beer for cyclists article. I think we should take this one step further and turn the notion of entitled cyclists from last friday’s post on its head. 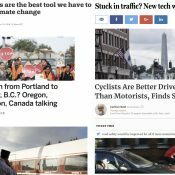 Lets take the advise of some of the commenters here on Bike Portland and refocus our efforts away from making it harder to drive and instead instead focus them on promoting and glorifying the efforts of cyclists. 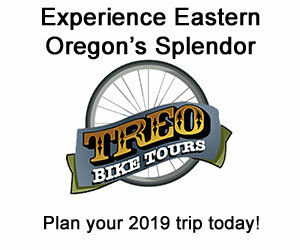 In addition to free beer lets have special VIP sections at Blazer and Timbers games only available to cyclists at discount prices. Lets let cyclists skip the line at popular bars, restaurants and concerts. Lets let cyclists have first dibs on the close in apartments and hard to get in to schools. Cyclists are doing their part to save the planet, reduce congestion and improve the urban environment. 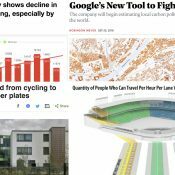 Lets give them the recognition and entitlement they deserve and I bet our our Portland cycling numbers will skyrocket. You’d get to the first dibs on apartments thing if we actually restricted no-parking apartment buildings to those with no cars. That would also make them more appealing to neighbors worried that their streets will be filled with apartment dwellers’ cars. I tried that ten years ago: through my neighborhood association we were willing to supply incentive packages to those folks interested in moving into transit proximate apartment buildings IFF they didn’t own a car. While the developer’s representative appreciated the gesture, some law or code prevented this kind of discrimination. Very frustrating. More than likely the developer didn’t want to participate. I hope that cool rewards program was simply in its early stages and had low adoption rates that will increase over time. Otherwise, that 10 km walked/biked/transitted isn’t really much penetration. Video on Italian bike promotion shows a car at a stop sign failing to yield to a bike. If only we could require that those features have video of the event sent to authorities for processing. They’re not dead, they’re just sleeping! Your “Come Clean on Climate” article appears to be behind a paywall. If your browser has “secret” or “incognito” mode, try it with that turned on. 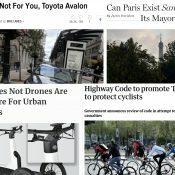 I use archive.is for getting around most paywalls when needed. I’ve already made my peace with the fact that within a few years, what was once the bicycle lane will mainly be a place for e-motorized vehicles that aren’t quite as fast as cars, but quite a bit quicker than whatever plodding pace my aging legs will be able to maintain on my hopelessly anachronistic push bicycles. Not me. Working on my pedal-powered EMP device, now. This is exactly why I think transit will be toast when the robot cars arrive. When better* options arrive, people use them. And I think robot cars will be cheaper and therefore even better than the taxisharing companies are today. *Better according to what the people making the decision think, not better according to what readers of this site wish those people would do. Oopsie, you forgot about one factor: Space and we ain’t getting more of it! With more people living in less space, how they move around is largely dictated by mode efficiency, not preference or cost. And as congestion worsens, less vehicle throughput will mean less network efficiency for mobility providers, increasing cost. Robot or not, there are certain constraints which are unavoidable. SOVs are cancer and must be eradicated. Why do you assume cars will always be the same size as they are today? Or that automated cars will all be single occupancy? I know it’s not what you meant, but I suspect there will be plenty of zero occupancy vehicles hauling cargo around. The might be very small. So the automated cars of the future will be small on the outside,but big on the inside so they can haul multiple passengers, like an Arabian Tent from a 1960’s cartoon. The way that Moore’s law is currently stalling out ( Intel has been unsuccessfully trying make usuable 10nm chips since 2011), the automated cars of the future will have to be larger to haul around the giant computers and batteries needed to power them. I suspect there will be more than one size of vehicle. How much smaller or larger do you have in mind? You’re right, they will probably keep getting bigger. Until they’re the size of a bus and people realize we tricked them into using transit. $5 to go anywhere I want in the metro area all day long. I don’t think that’s going away because I don’t think private companies can compete with that price. If it’s such a great deal, why does taxisharing steal passengers from transit? It’s way more expensive. Automated cars taxis will be cheaper than Lyft is today when there’s no driver to pay. Maybe not $5 to go anywhere in the city all day, but most people don’t need to do that most of the time. All evidence shows that many people want something a little more point-to-point and not on a fixed schedule, and are willing to pay for it. Some people can pay, but most transit riders can’t. I’ll believe the reduced costs when I see it. Driverless technology is not anywhere close to where it needs to be for a wide scale rollout. And even if it gets there, it’s even easier to automate fixed-route transit. VC-subsidized Uber/Lyft are picking off choice riders during the biggest economic boom of our generation. When the economy tanks and/or gas prices go up, we don’t know what will happen. It would also burn more fuel — the reason ROR came to the east coast, at least, was to save gas. What burns more fuel, people being afraid to walk or ride bikes or having cars get stuck a wee bit longer on their trips? I think the answer is obvious for the medium and long-run. I would support restricting ROR. I was just pointing out there are real costs to doing so. It’s not just a “convenience” thing. Always quick with the contrary view, even if it is dubious. Look into the history of the law. Soren makes a good point, and that is in an era of electric and hybrid vehicles, the fuel issue may no longer apply. I think it’s possible to construct a stronger argument for repealing right on red by acknowledging the reasons it was passed in the first place, and showing how they no longer apply. I think the English phrase is: fiddling while Rome burns. Arguing over the fuel(!) implications of right on red in 2018 is beyond absurd. Climate change dispctates that we phase out automobility (all internal combustion engines) by, yesterday. Not argue over crumbs. The time for that was 1978. I said I would support the change, and want to present the strongest case for it I can. It doesn’t burn as much gas as turning left, though, and we haven’t banned that. (UPS routes drivers to turn left as minimally as possible, and learned they save gas with that technique. Their primary goal had been to avoid collision risk by avoiding crossing traffic; coincidentally what drivers do by turning right on red lights across crosswalks). A growing percentage of vehicles in portland automatically shut off when idling (e.g. just about every hybrid engine vehicle). It also wears out the engine sooner, meaning you have to replace the vehicle sooner, and that negates the carbon reduction of the fuel savings. This is the ostensible reason, but I think it would burn nearly negligible amounts of extra fuel. The real fuel cost is accelerating from the stop you are required to make whether turning on red is allowed or not. The extra 30 seconds of idling is nothing compared to that. I would imagine that a longish line of cars waiting to turn right on red would burn more fuel lurching up to the stop line as one car at a time makes the turn than they would idling for 30 seconds, then moving at a more steady pace up to the intersection. For just cars or for all road users like bicycles and electric motorized bikes? I assume we bicycles will have to adhere to the no red on right since we have to follow the same rules of the road. Does not compute. There are several laws specific to the vehicle you’re operating. If they don’t include an exception for bicycles then you can just go through the crosswalk across the corner of the sidewalk, and into the roadway to your right. Instead of making ROR illegal, I would support strict liability laws for ROR. Hit somebody while turning right on red? You are 100% liable. Except the police (in most if not all jurisdictions) have said that ignorance of the law is not an excuse, so you wouldn’t get to use that one. If your turning right on a red light the pedestrians, bike riders and vehicles are coming from the left or the opposite left turn lane and you should have an unrestricted view out the left window. This excuse should never be accepted. Sidewalk (or MUP, in some cases) users come from both directions. I was hit because a driver making a right on red was looking left while he drove to the right. We don’t have as large of a liability problem as we do an enforcement and penalty problem. I guess the question becomes which is more valuable, petrol or human life? I have a pretty good idea which one our society has valued more since the industrial revolution, but that doesn’t make it the morally correct choice. With climate change, it’s not a simple tradeoff. Yeah, we’ll need to burn significantly less gas than that saved by RoR to make inroads against it. In fact, I think the effect of RoR is probably negligible compared to the actions needed and not really worth consideration as a serious measure. Getting rid of it could save pedestrian lives and make our streets a safer place in the meantime. The future is not petrol-powered. 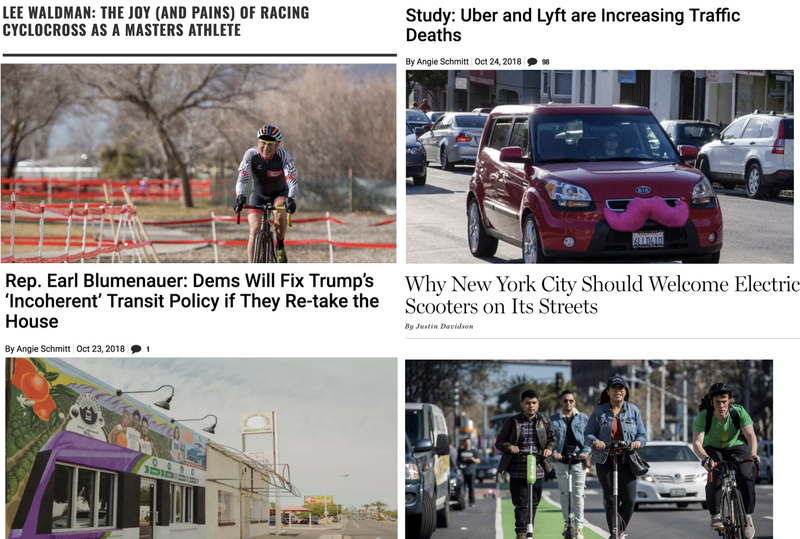 The Uber/Lyft adding danger and miles to cities that adopt it seems kind of weak. Driving and road deaths went up dramatically during the years they looked at even in places that didn’t have Uber/Lyft. (I’m looking at you, Oregon.) I think this is largely a case of correlation not being related to causation. Seriously, they found a 3% increase in roadway deaths correlated with the introduction of rideshare while Oregon, which was lacking rideshare during that time frame, saw a 50% increase in roadway deaths. Bad timing for such a study; too many changes were happening (Millennials were belatedly getting licenses in large numbers and distracted driving became normalized, among other things). I want to hate on these services as much as the next person, probably more, but we need to go after them with solid studies, not marginal stuff that doesn’t hold up. I am not following. Climate change makes lots of decisions easier. Why is this different? We were in Livingston, MT. a few years back, and they had a petition for a “silly walk” downtown. Seemed like a neat ida. From what I can tell from this headline, it seems as if the city commission voted it down. Too bad. PBOT, could we have some places that are set up so that personal motor vehicles can arrive there, or drop off there, but not penetrate, transit, mill about and trample there? I imagine this in downtown or the Pearl District, two places that are very familiar to me, but if it some place in the E numbers had that feature I’d be tempted to move there. Entry level car moderation: designated U/L spots. Anyone doing random pickups on the bus mall gets a mega latte in the driver’s seat. Or car crushing as they prefer. Seriously: why would any try to drive in the Burnside/13th/Everett/9th square? It’s a heartbreak to park a car there. Help! Please! Scooters, free electric jitneys circulating in small zones, optimized transit routes and light timing, pedestrian zones, better bike parking: all things are possible if so much really valuable urban real estate were not donated to private motor vehicle operators. If we set up super-blocks with no private car crossings in the middle, we could have 4-car MAX trains with fewer stations (double capacity, faster crossing of downtown). Sure, rebuilding stations would be an expensive retro fit. Digging tunnels: not happening. For the Steel Bridge, maybe a tunnel. We need a vision, or maybe just a simple plan, for the day that bridge falls in the water. Or the lift fails, or whatever it is.